A few weeks ago now, an unnamed source supplied me with the following diagram of what is said to be a Joecell mark 5 version. I have not seen or handled the actual device and so my knowledge is somewhat limited, but I have made the following assumptions from this diagram reproduced on this web page. You may find out more if you try some experiments yourself. My contact says that claims were made, that it was said to produce gold and other metals (something by the way I find hard to believe). Another source believes that it is a Joe device, but is used only as a flame arrestor,something I personally believe could be done. 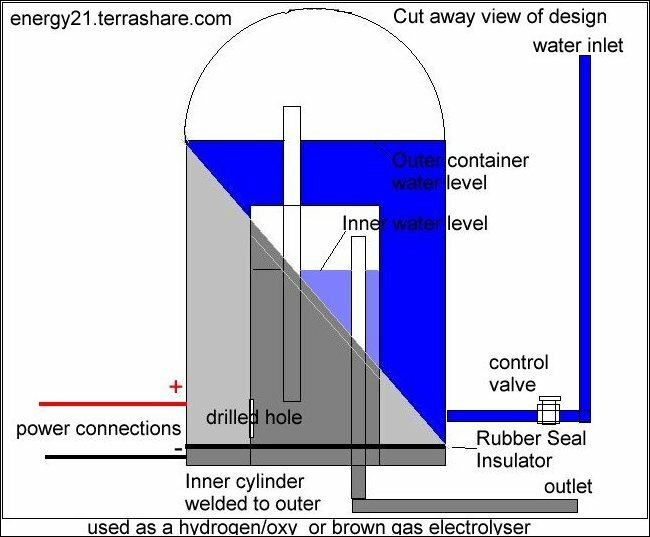 It would not need the power, but would need a hydrogen/oxy gas inlet ,and if so, I suspect that this gas gas inlet would be on the outer cylinder (as per the third diagram below) and situated somewhere below the outer container water level. This alledged Joecell mark 5 seems to be one larger metal cylinder into which another closed cylinder has been welded to the bottom portion of the outer enclosure. A rubber seal or insulation is provided at bottom of unit as per diagram, to allow a negative power connection and a positive power connection to be used to power this unit and not be shorted out through the metal surfaces. From the diagram recieved the outer container has a positive electrical connection and the bottom portion and the inner metal cylinder is a negative electrical connection. How it works or at least how I think it would (1) Gas is produced my means of electrolysis when a battery is connected to the positive and negative plate terminals. (2) Gas flows through water to the top area of the outer containment vessel at position (3) After the unit has been running for a period the gas pressure would build up and force the water below (4) below the inlet pipe by forcing excess water to flow through outlet section. Gas under pressure is then forced through this pipe until it exits and bubbles out at position (5) where again it flows to top of second inner vessel at position (6). Gas again begins up to build up pressure and then forces the remaining water in the outlet pipe and then allows the resulting gas to flow out through the outlet. It would seems to me that when gas pressure is exhausted then water would again fill this pipe section and not allow a flame flash back. This the set up I assume would be used if the device is only used as a flame flash back arrestor. This is the set up if the device is indeed used as a hydrogen/oxygen generator. Please note the original joe cell was said to have not need addition water input after it began operation, and so my assumption as to how this device as to a water inlet would be incorrect. Hi Geoff Thanks for the info . 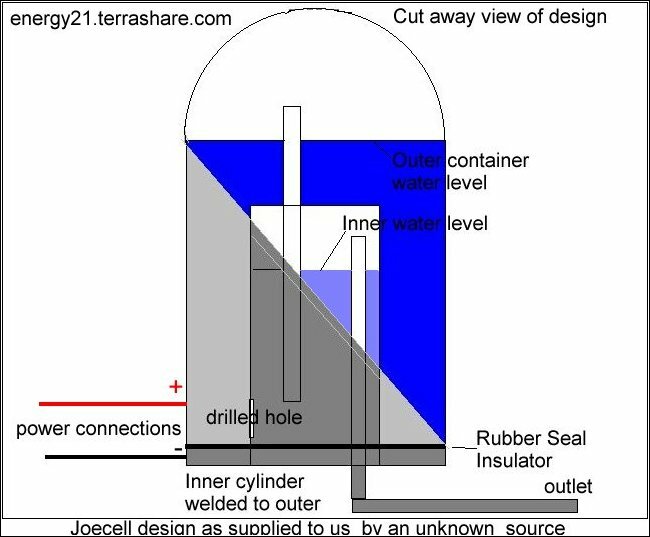 the design as outlined is discussed in the second video and joe blow talks about the flash arrestor design using the centre tube water in isolation to snuff any flash back. 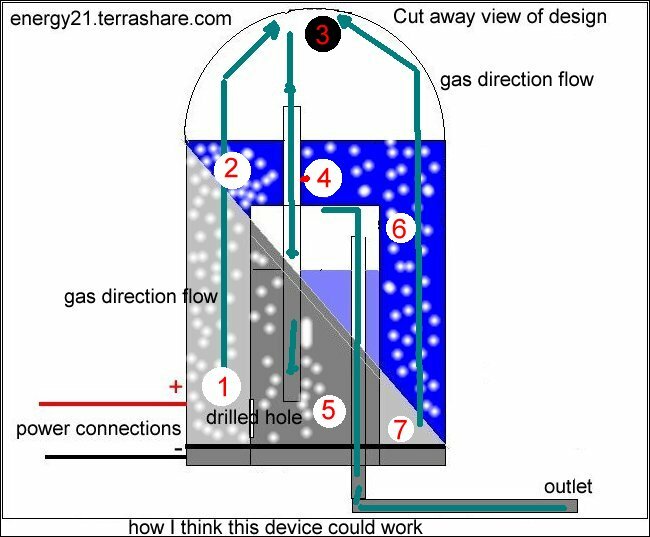 Can I make a few points I'm constructing one of these as we speak and i feel it is a case of due diligence to isolate gas production from any potential source of ignition the cell as described will do this. And do'nt forget we are not going for pressure, only vacuum will be acting on the cell, and removing only production gases (what else can it take?) but under scrutiny i feel any device that has the potential to harm should incorporate some standard or standardized safety feature. The other point is My Construction.I still use the bolt wedged in the centre tube idea but i have drilled it and welded the inner production tube to it so it acts as my neg electrode and my gas outlet. Remember any pressure or vacuum will act on all surfaces equally. 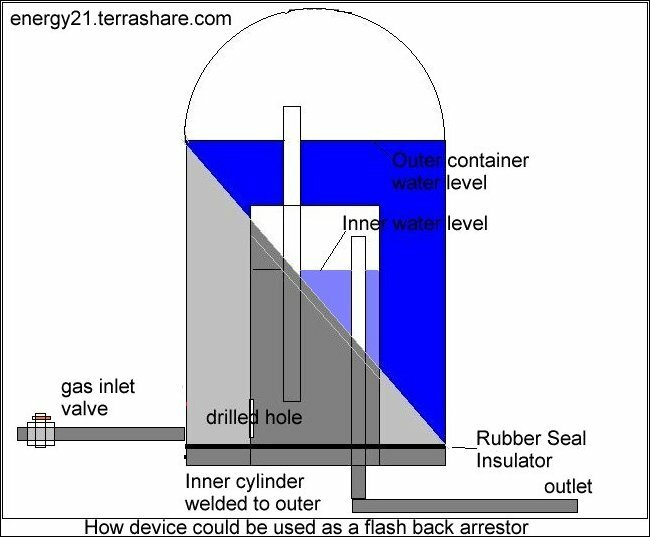 I'm not making a gas torch just a J cell I use multi tubes these radiate the orgone the water accumulates and I feel the small DC current sets this up and the vacuum pulls it plus some gas into the motor and if all things going as dreamed my petrol bills should start going down. Oh yes I have a welded base and a removable top on this thing and a bolt plug on the top to add water and to stay with my due diligence I will put a 1-2 psi valve on top and vent it.